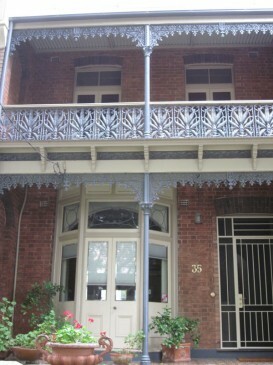 Both this house and No 29 use native flora in their lace and mouldings. Arcadia Road has a mixture of small villas and large terraces of Italianate and Federation styles, dating mainly from the very end of the C19th and the very beginning of the C 20th. 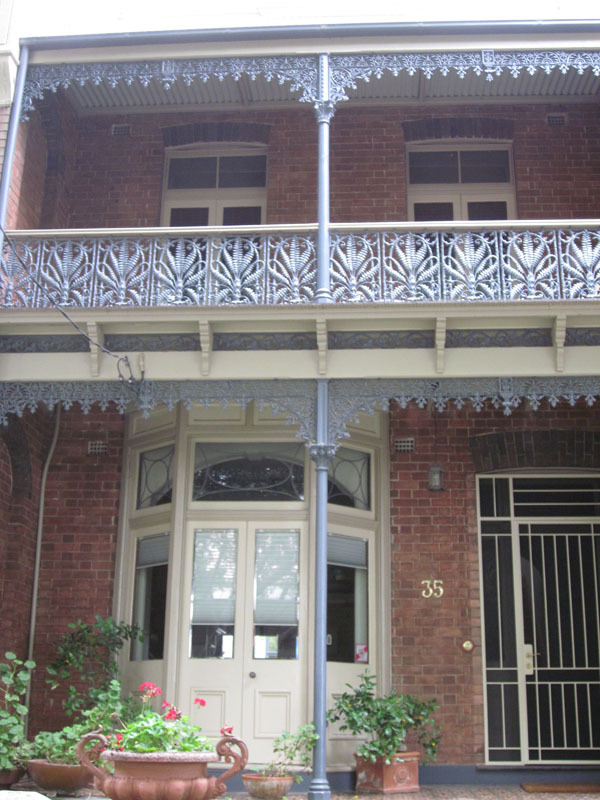 No 35 (1901) is a terrace with tuck-pointed exposed brick, rare in a Glebe terrace, and a wooden bay. 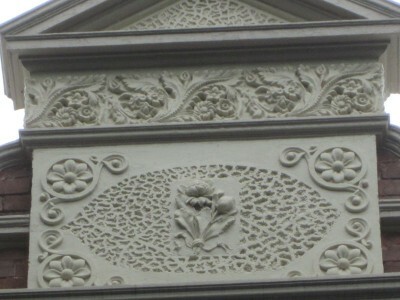 The lace portrays native ferns, and there is a central pediment with waratahs in the centre and flannel flowers in the four corners. No 29 has the same native fern lace, but with a frieze of ferns as well, with an unidentified yellow flower, possibly a native daisy, in the pediment. Several other houses in this street demonstrate that even small cottages could use architectural features to look more imposing. Parapets were used in small cottages as well as terraces. There is a the peeping parapet, which continues the faceted bay form above the roof line, at No 31, Omega (1895). No 17, Liansley House, 1901, makes use of a balustraded parapet. This added a note of self-importance, but at the cost of making the bay beneath flat and rectangular. The elaborate keystone on the curved window head in the bay window at No 15,Ivanhoe Villa (1896) features a handsome semi-bust of a Grecian figure. The moulded buttresses under the eaves serve a purely decorative function. There is an elaborate wrought iron fence and gate.